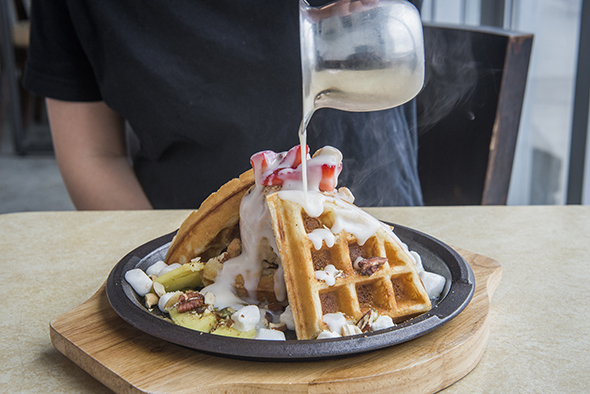 Waffles in Toronto go beyond your basic Eggo. Whether you're hankering for a savoury brunch, a treat to cool you down or a dessert to cap off your dinner, there are plenty of options to choose from. 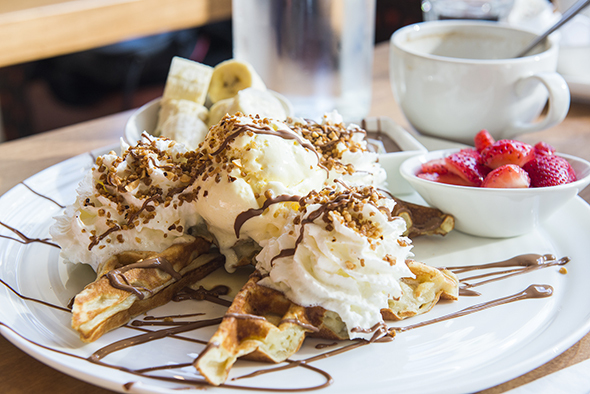 Here's a round-up of places to indulge in waffles in Toronto. Now here's a waffle you can feel good about devouring. The K&K Waffle comprises buckwheat, oats and tapioca flour and then is garnished with plump blueberries, hemp seeds and a scoop of dairy-free Coconut Bliss vanilla ice cream. LiĂ¨ge waffles are the star at this all waffle eatery. 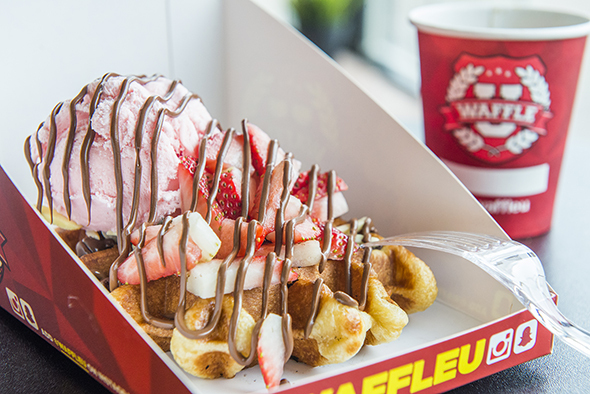 Each waffle gets loaded with a slew of unlimited toppings like Nutella, gummy bears, fresh fruit and ice cream. Wedged between the St. Lawrence Market and the Distillery District is this chicken and waffles joint. Their What The Cluck! 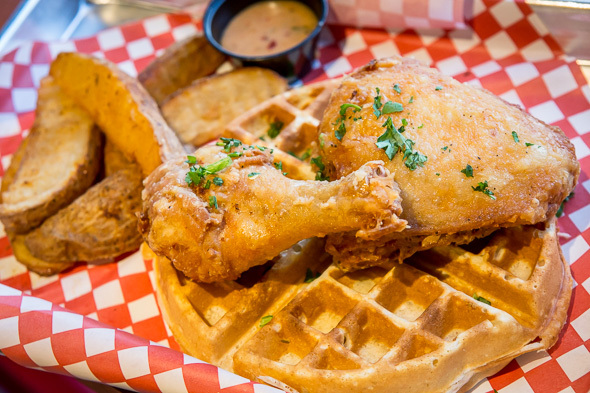 comes with two pieces of bone-in chicken over a scratch-made waffle. Head to this Markham spot for their thrilling hot plates. There's a little form you can fill out where you can choose your waffle base and a selection of ice cream and toppings. This Pacific Mall vendor slings out sweet and savoury waffle sticks filled with things like hot dogs, custard to ube. 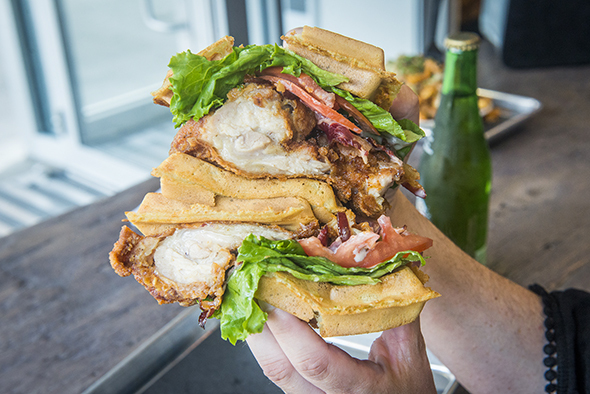 This chicken and waffles joint makes a Dirty Club stacked high with waffle buns layered with boneless fried chicken, beef bacon, tomato, lettuce and maple aioli. Here you'll discover a menu devoted entirely to waffles. Start off your meal with the snack-worthy signature waffle bacon. 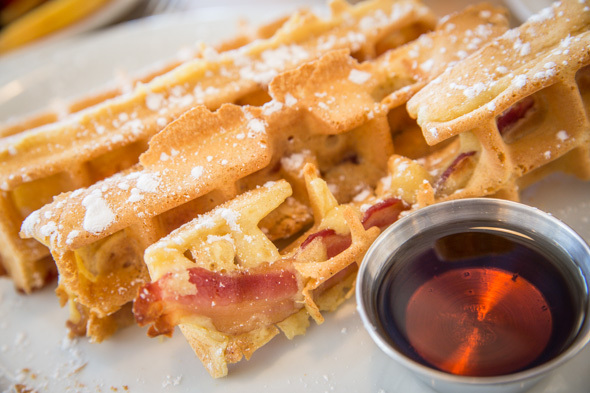 Strips of bacon are battered and pressed into a waffle iron then served with maple syrup for dipping. 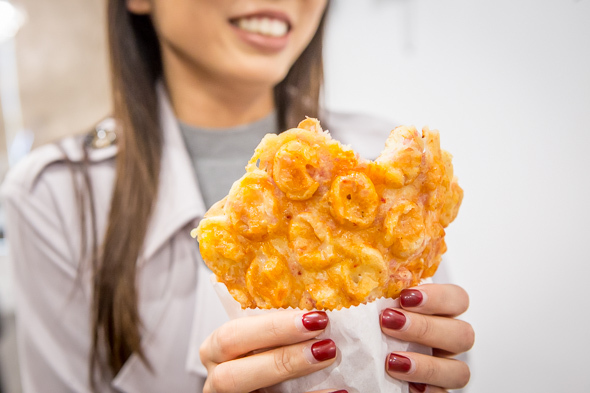 While Hong Kong style waffles and ice cream may be the showstopper at this Markham food stall don't pass up the chance to try their Lap Cheung waffle. 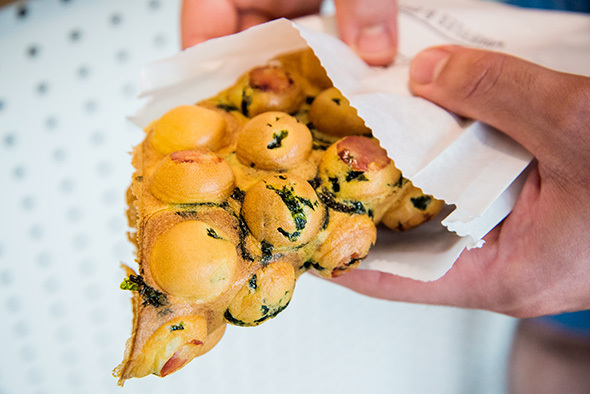 This dim sum inspired waffle contains Chinese sausage and seaweed which makes for one unique treat. The popular Montreal chain has found a home in Toronto and is filling our bellies with seriously delicious desserts. The choco-nut waffle is one of the restaurant's most popular dishes and comprises candied hazelnuts, chocolate, toffee bananas and vanilla ice cream. 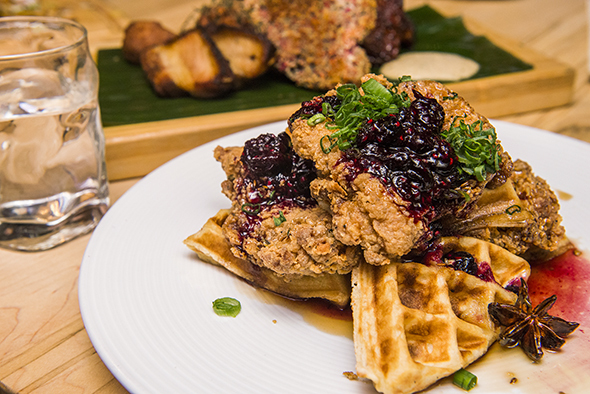 This Baldwin Village Filipino restaurant offers up a twist on your classic chicken and waffles. 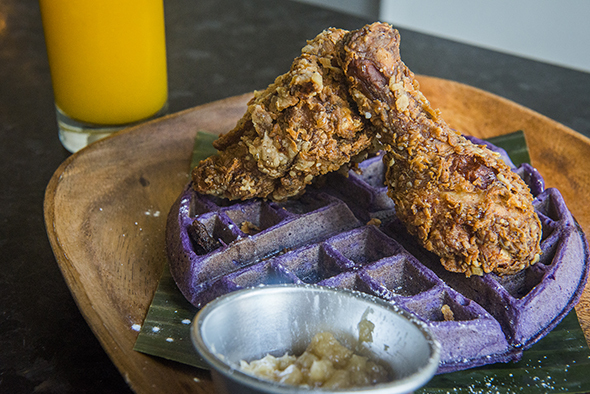 Waffles are made with ube and served along side crispy fried chicken. 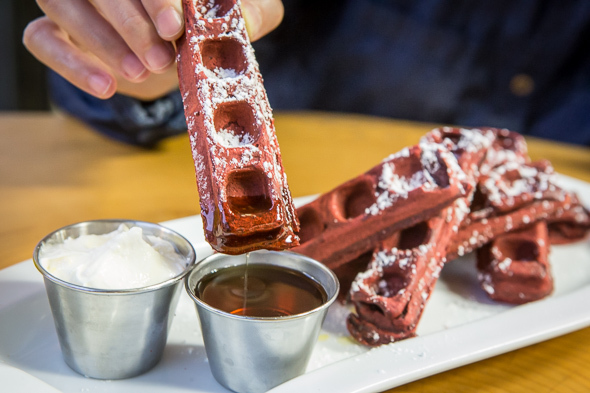 Red velvet waffle stix are on the menu at this vegan cafe. They're light, cake-like delights in waffle form served with maple syrup and vegan buttercream and lemon frosting dips. Here you'll discover Western comfort foods with an Eastern flair. Their Chicken & Waffles can be seen all over Instagram and come with ridiculously tender yet crispy and well-marinated chicken, freshly made waffle and berry jam. This ice cream parlour and bakeshop is locally famous for their delicious treats - just check out the line. 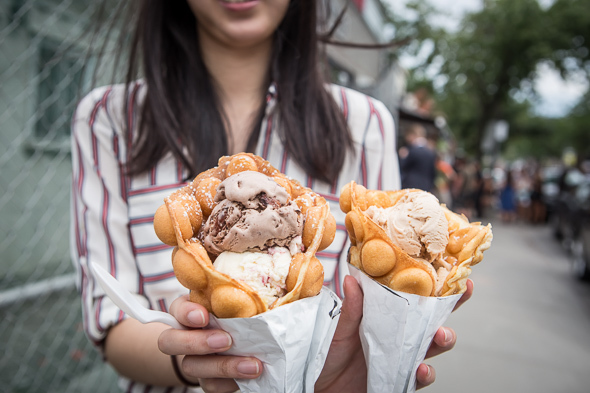 Their Hong Kong style waffle cones are made to order and filled to the nines with your choice of ice cream. 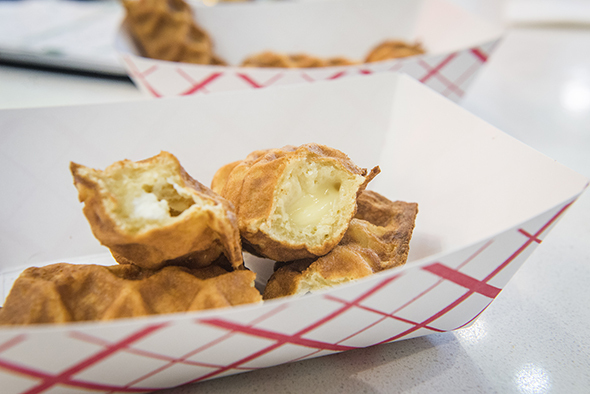 While their epic soft serve may be all the rage don't forget their waffles sandwiches. 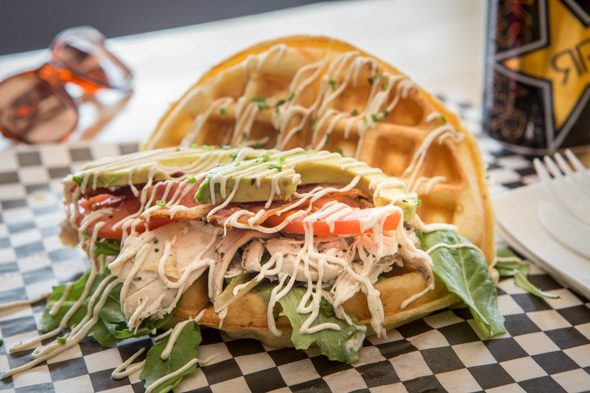 Order up the Original Junkie and enjoy a waffle topped with avocado, bacon, pulled roasted chicken and sage mayo. This small dessert shop in Toronto's Little Tokyo makes frozen sweets along with bubble waffles loaded with ingredients like ham and cheese and sautĂŠed mushrooms. What did I miss? Add your favourite spot to get waffles in the comments. Photos by Hector Vasquez and Jesse Milns.